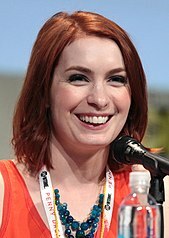 Kathryn Felicia Day (born June 28, 1979) is an American actress, writer, and web series creator. She is the creator, star, writer, and producer of the original web series The Guild (2007–2013), a show loosely based on her life as a gamer. She also wrote and starred in the Dragon Age web series Dragon Age: Redemption (2011). Day was a member of the board of directors of the International Academy of Web Television beginning December 2009 until the end of July 2012. On television, she has played Vi in the series Buffy the Vampire Slayer (2003) and Dr. Holly Marten in Eureka (2011), and had a recurring role as Charlie Bradbury on Supernatural (2012–2015, 2018). She has also acted in movies such as Bring It On Again (2004), as well as the Internet musical Dr. Horrible's Sing-Along Blog (2008). In April 2017, she began appearing as Kinga Forrester in Mystery Science Theater 3000. Day was born in Huntsville, Alabama. She began her acting career at the age of 7 when she starred as Scout in a local production of To Kill a Mockingbird. She studied operatic singing and ballet professionally, performing at concerts and competitions nationwide. Home-schooled throughout much of her childhood, she began college at the age of 16. She was a National Merit Scholar (1995) and graduated as valedictorian of her class. An accomplished violinist, Day was accepted to the Juilliard School of Music but chose to attend the University of Texas at Austin on a full scholarship in violin performance. She double majored in mathematics and music performance, and graduated at the age of 19 in the top 4% of her class. She is also an avid player of a wide variety of video game genres. Much of her work on The Guild web series was based on her personal experience with video games, especially when she played World of Warcraft. After graduation, Day moved to Los Angeles to pursue a career in acting. She landed several roles in various short and independent films as well as commercials and guest spots on television shows, including Undeclared and Maybe It's Me. These parts propelled her to larger roles: a part in the film Bring It On Again, the starring role in June, and a recurring guest spot as potential Slayer Vi on television's Buffy the Vampire Slayer, a recurring role that is still occasionally used in that show's eighth season comic book series. In HBO's 2005 biopic of Franklin D. Roosevelt, Warm Springs, Day's singing was featured when her wheelchair-using character serenaded a dinner group with "I Won't Dance". Day is the creator, writer, and star of The Guild, a web series which aired from 2007 to 2013 and explored the MMORPG gaming subculture. The first season was primarily hosted on YouTube, where it garnered millions of views. Its second season premiered on Microsoft's three major video channels, Xbox Live, MSN Video and The Zune Marketplace, after Microsoft made a deal with The Guild, allowing Day, her cast and her crew to be paid for their work. Day also created a song and music video called "(Do You Wanna Date My) Avatar", featuring the cast dressed up as their in-game personae. The final moments of the music video itself also detailed that the release date for the third season of Day's The Guild would be August 25, 2009. A second song and Bollywood style video "Game On" was released prior to the premiere of the fourth season of The Guild. A third and final music video, called "I'm the One That's Cool", features the members of the cast in the guise of an alternative band performing at a local venue, intercut with scenes of the cast as younger versions of their characters experiencing bullying at the hands of "cooler" and more popular kids while at school. The Guild has won multiple awards, including the Greenlight Award for Best Original Digital Series Production at the South by Southwest festivals, several IAWTV Awards, including Best Comedy Series, the YouTube Video Award for Best Series, the Yahoo! Video Award for Best Series, and 2009 Streamy Awards for Best Comedy Web Series, Best Female Actor in a Comedy Web Series, and Best Ensemble Cast in a Web Series. In March 2012, Day announced that she would be launching a premium YouTube channel, "Geek & Sundry," on April 2. In August 2014, Geek and Sundry was acquired by Legendary to produce content alongside of Chris Hardwick's Nerdist Industries, with Day retaining creative control. In July 2008, Day starred as Penny in the three-part web-based musical Dr. Horrible's Sing-Along Blog (created by Joss Whedon, who also created Dollhouse and Buffy the Vampire Slayer, in which Day had parts). Day was featured as a patient in the episode "Not Cancer" of the medical drama House, and had a guest starring role in the sci-fi drama Dollhouse's unaired episode "Epitaph One", as well as its series finale "Epitaph Two." Also in 2008, Day was featured in a series of commercials for Sears Blue Crew. She also appeared in the first of the revitalized Cheetos commercials. Day promoting Con Man at the 2015 San Diego Comic-Con. In the series Lie to Me, on the episode called "Tractor Man," airing December 14, 2009, Day sang a song called "White Lie" alongside Brendan Hines. Day starred with Kavan Smith in the Syfy film adaption of the Little Red Riding Hood saga, called Red, produced by Angela Mancuso. Day also played the continuing role of Dr. Holly Marten in the Syfy channel's original series, Eureka, appearing in 18 episodes during the last two seasons of the show. Day has also played the role of 'Gorgol' in the web series MyMusic directed by The Fine Brothers. In February 2011, Day announced that she would be starring in a new web miniseries. Called Dragon Age: Redemption, it is based on the Dragon Age video games made by BioWare and aired on October 10, 2011. Day plays an elf named Tallis, and returns as the voice and model for the character in the Dragon Age II downloadable content "Mark of the Assassin." In January 2012, Day announced that she would be hosting a Google+ Hangout called Vaginal Fantasy. The Hangout features Day along with Kiala Kazebee, Veronica Belmont, and Bonnie Burton. Every month they discuss lady-leaning paranormal and historical adventure books. In February 2012, Day guest starred in Sean "Day" Plott's online webcast featuring Kingdoms of Amalur: Reckoning. In April 2012, it was announced that Day would host the 2012 IndieCade Awards Ceremony on October 4, 2012. Also in April of that year, Day appeared on the YouTube show MyMusic as a Norwegian Black Metal singer named Gorgol. She guest starred in the second season of the Jane Espenson scripted web series, Husbands. In October 2012, she guest starred on The Game Station podcast and appeared in an episode of My Drunk Kitchen. In 2013, Geek & Sundry and Atlas Games worked together to release a promotional pack for the card game Gloom for TableTop Day 2013 with a Felicia Day, Guild Goddess card. In 2014, Alderac Entertainment Group included a Felicia Day card in the storage case expansion, The Big Geeky Box for their card game Smash Up. In 2015, Plaid Hat Games released a Felicia Day character card for their board game Dead of Winter: A Cross Roads Game for Tabletop Day 2015. On August 4, 2015, Day guest starred on Episode 9 of the Dear Hank & John podcast. On October 1, 2016, Day provided a guest voice for the Welcome to Night Vale podcast as Zookeeper Joanna Rey. In April 2017, she began appearing as Kinga Forrester in Mystery Science Theater 3000. In August 2017, Day appeared as a guest in the My Little Pony: Friendship Is Magic episode "The Perfect Pear", voicing Pear "Buttercup" Butter, the presumed-deceased mother of one of the show's main characters, Applejack. In the episode, she also performs a romantic ballad, titled "You're In My Head Like a Catchy Song". Day organised and hosted a Twitch.tv charity livestream on 30 June 2018, in aid of Refugee and Immigrant Center for Education and Legal Services (RAICES), a Texas nonprofit. The 12 hour livestream raised over $212,000. Day has appeared in two episodes of the Syfy channel original series The Magicians as Poppy Kline (2018-2019). In September 2008, TV Week included her in their list of Top 10 Web Video Creators. During the inaugural Streamy Awards held in Los Angeles on March 28, 2009, Day received the award for the "Best Female Actor in a Comedy" for her work as protagonist Cyd Sherman in The Guild, and won the same award again in 2010. She was also recognized for her work on Dr. Horrible's Sing-Along Blog in 2009. Day was also nominated for the Best Guest Appearance Award for the 3rd Streamy Awards. In June 2018, she won a Behind the Voice Actors Award in Best Female Vocal Performance in a Television Series in a Guest Role for her role as Pear Butter in the episode "The Perfect Pear". On January 3, 2017, Day announced on social media that she was pregnant and expecting a baby girl in a few weeks. She announced her daughter's birth on January 30, 2017. 2001 Emeril Cherie Episode: "Whose Life Is It Anyway?" 2002 Maybe It's Me Cookie Episode: "The Crazy-Girl Episode"
For the People Nicole Episode: "Nexus"
Undeclared Sheila Episode: "God Visits"
2004 Century City Sheryl Episode: "The Haunting"
Strong Medicine Jesse's Friend Episode: "Positive Results"
One on One Sarah Episode: "We'll Take Manhattan"
Monk Heidi Gefsky Episode: "Mr. Monk Gets Drunk"
2006 Windfall Danielle Episodes: "Changing Partners", "Crash Into You"
Love, Inc. Natalie Episode: "Hello, Larry"
2008 House Apple Episode: "Not Cancer"
My Boys Heather Episode: "Madder of Degrees"
Dollhouse Mag Episodes: "Epitaph One", "Epitaph Two: Return"
IRrelevant Astronomy Felicia Day Episode: "Behind the Scenes: When Galaxies Collide"
Lie to Me Ms. Angela Episode: "Tractor Man"
Three Rivers Jeni Episode: "A Roll of the Dice"
2010 A Comicbook Orange Herself Episode: "Felicia Day & Viking"
Episode: "Dan vs. The Boss"
YOMYOMF Herself Episode: "KevJumba Takes the SAT w/ Felicia Day"
The Game Station Podcast Herself Episode: "Episode 27"
2013 Felicia's Ark Herself Weekly series running from April 1 to May 13. 2015 Critical Role Lyra Episodes 18 & 19: "Trial of the Take: Part 1 & 2"
The Librarians Charlotte Episode: "And the Tears of a Clown"
Episode: "Grendel's Moving Castle/The Great Gadfly"
2019 The Rookie Dr. Morgan Episode: "Free Fall"
Day is the author of the memoir You're Never Weird on the Internet (Almost), as well as numerous works relating to the Guild web series. ^ Felicia's College Resume, Archive of "utexas.edu/~felicia/personal.html"
^ McDowell, Ian (January 11, 2017). "Felicia Day". Encyclopedia of Alabama. Retrieved October 3, 2018. ^ "International Academy of Web Television Names Inaugural chairman and board of directors" (PDF) (Press release). IAWTV. December 14, 2009. Archived from the original (PDF) on July 26, 2011. Retrieved January 10, 2010. ^ "International Academy of Web Television Announces New Members of the board of directors" (Press release). IAWTV. July 27, 2011. Archived from the original on March 1, 2012. Retrieved August 18, 2012. ^ Felicia Day (April 19, 2016). You're Never Weird on the Internet (Almost): A Memoir. Simon and Schuster. pp. 83–84. ISBN 978-1-4767-8566-0. ^ a b c "Cover Girl Felicia Day (Part I) with Melissa A. Bartell". Archived from the original on May 6, 2012. Retrieved October 26, 2012. ^ "Scholars You May Know". National Merit Scholarship Corp. Archived from the original on June 12, 2010. Retrieved August 3, 2009. ^ a b Hryb, Larry (January 25, 2009). "Major Nelson: Show #306 : Felicia Day, RE5 and enforcement on Xbox LIVE". Felicia Day interview. MajorNelson.com. Archived from the original on February 1, 2009. Retrieved January 27, 2009. ^ Trapani, Gina. "How Dr. Horrible's Felicia Day Gets Things Done", LifeHacker. August 4, 2008. ^ "Degrees and Dates of Attendance". The University of Texas at Austin. Retrieved May 25, 2015. ^ "Gaming Nexus Interview 2/18/2009". Retrieved December 24, 2009. ^ Felicia Day’s memoir is fun but shallow Retrieved November 21, 2015. ^ Monica Hesse (April 3, 2012). "Felicia Day: A rising star for the Internet geek". The Washington Post. ^ Jøn, A. Asbjørn (2010). "The Development of MMORPG Culture and The Guild". Australian Folklore: A Yearly Journal of Folklore Studies. 25: 97–112. ^ Daisy Whitney (March 2008). "Popular but Not Profitable" Archived April 11, 2008, at the Wayback Machine. TelevisionWeek, 27(8), 3,28. Retrieved November 5, 2008, from ABI/INFORM Global database. (Document ID: 1454502881). ^ Press Release. "The Guild And "Knock Off" Take Top Honors At The Greenlight Awards" Archived May 16, 2008, at the Wayback Machine, ON Networks Inc. March 11, 2008. Retrieved on November 5, 2008. ^ "IAWTV Awards - Past Winners". International Academy of Web Television. Retrieved September 17, 2017. ^ 2007 YouTube Video Awards, List of 2007 Winners. Retrieved on November 5, 2008. ^ "The Yahoo! Video Awards: The Results!" Archived March 22, 2008, at the Wayback Machine, Yahoo Video Blog. March 21, 2008. Retrieved on November 5, 2008. ^ Gaudiosi, John (March 17, 2012). "WonderCon 2012: Felicia Day Launches Geek & Sundry YouTube Channel". Forbes. Retrieved March 19, 2012. ^ "Watch C2E2: The Critical Role Cast Shares Their Origin Story". Syfy. Syfy. Retrieved February 17, 2019. ^ "Legendary Acquires Felicia Day's Geek & Sundry". Bleeding Cool. August 10, 2014. Retrieved August 11, 2014. ^ Caroline van Oosten de Boer, Milo Vermeulen. "Comments on 15781: Neil Patrick Harris working with Joss Whedon?". Whedonesque. ^ House Episode 5.02 – Not Cancer – Press Release Archived December 27, 2008, at the Wayback Machine, FoxFlash. September 23, 2008. Retrieved on November 5, 2008. ^ 13 facts about 'Epitaph One,' the 'lost' episode of 'Dollhouse', The Watcher, Chicago Tribune, July 6, 2009. ^ Clacked by Annie Wu on (October 17, 2008). "Dr. Horrible's Felicia Day moonlights for Sears | CliqueClack TV". Cliqueclack.com. Retrieved April 24, 2012. ^ "blue". YouTube. September 30, 2008. ^ YouTube of Cheetos Commercial, November 26, 2008. ^ "Felicia Day Sees Red When it Comes to Werewolves on Syfy". Dreadcentral.com. March 8, 2010. ^ "New Syfy Saturday Original Movie To Star Felicia Day ("The Guild", "Dr. Horrible") in Re-Imagining of "Little Red Riding Hood"". Tvbythenumbers.com. March 8, 2010. ^ "Felicia Day Blog Archive: Dragon Age: Redemption". Feliciaday.com. February 15, 2011. ^ "Late Night with Jimmy Fallon – Dragon Age: Redemption Trailer". Latenightwithjimmyfallon.com. ^ "Felicia Day Blog Archive: Vaginal Fantasy Book Hangout". Feliciaday.com. ^ "Felicia Day and Day: Kingdoms of Amalur: Reckoning! Part 1". ^ "Gamasutra: Felicia Day to Host Fifth Annual IndieCade Red Carpet Awards Ceremony". Gamasutra. April 19, 2012. Retrieved April 19, 2012. ^ "MyMusic: INVISIBLE (Episode 3)". Youtube.com. April 29, 2012. ^ Vary, Adam B (June 28, 2012). "'Husbands': EP and star on season 2 of their gay-marriage web series – EXCLUSIVE PHOTOS". Entertainment Weekly. Retrieved June 28, 2012. ^ "Gloom: TableTop Promo Expansion". Board Game Geek. Retrieved August 16, 2016. ^ "Smash Up: The Big Geeky Box expansion". Board Game Geek. Retrieved May 12, 2017. ^ "Dead of Winter: Felicia Day". Board Game Geek. Retrieved August 16, 2016. ^ "iTunes - Podcasts - Dear Hank & John by Hank Green and John Green". iTunes. Retrieved August 11, 2015. 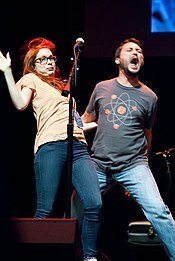 ^ "Funny or Die Hosts Charity Livestream Featuring Felicia Day, Seth Green, Alan Tudyk, and More". ^ "Poised to Leap" Archived September 17, 2008, at the Wayback Machine. (September 2008). TelevisionWeek, 27(23), 1, 25–26. Retrieved November 5, 2008, from ABI/INFORM Global database. (Document ID: 1570740411). ^ "2010 Winners – The Streamy Awards". Streamys.org. 2010. Archived from the original on November 14, 2010. ^ "3RD ANNUAL NOMINEES". Streamys. Retrieved January 20, 2013. ^ "BTVA Voice Acting Awards 2017 - Television | Behind The Voice Actors". Behind The Voice Actors. June 15, 2018. Retrieved June 15, 2018. ^ Day, Felicia (January 3, 2017). "She's coming in about three weeks so I guess I should announce this and stuff". Facebook. Retrieved March 12, 2019. ^ Day, Felicia (January 30, 2017). "Calliope Maeve has arrived! She is currently wearing a "Bard in Training" onesie. #LessThanThree <3(And yes that is a baby low jack on her ankle. Hospitals don't mess around anymore)". Facebook. Retrieved March 12, 2019. ^ "Retarded Policeman #7.5: Fish – with Felicia Day of The Guild". YouTube. Retrieved April 24, 2012. ^ Fowler, Matt (March 11, 2015). "Alan Tudyk and Nathan Fillion launch Indiegogo Campaign for Con Man". IGN. Retrieved March 13, 2015. ^ Guild Wars 2 – Behind the Scenes: Giving Tyria a Voice (YouTube). December 16, 2009. Event occurs at 2:03. ^ Day, Felicia (2015). You're Never Weird on the Internet (Almost). Simon & Schuster. ISBN 9781476785653. OCLC 913517863. ^ "Felicia Day (Author of The Guild)". Goodreads. Goodreads. Retrieved August 5, 2015. This page is based on the Wikipedia article Felicia Day; it is used under the Creative Commons Attribution-ShareAlike 3.0 Unported License (CC-BY-SA). You may redistribute it, verbatim or modified, providing that you comply with the terms of the CC-BY-SA.